You can list your business on Google for free. You can provide details about your business such as the hours of operation, photos, product offerings, and promotions. Google+ Local also provides you with analytics information that tells you how people find you on Google, what queries do they use, and geo locations from where people are searching for you. From a user perspective, Google+ Local allows online users to find local businesses on Google, read reviews, and more. 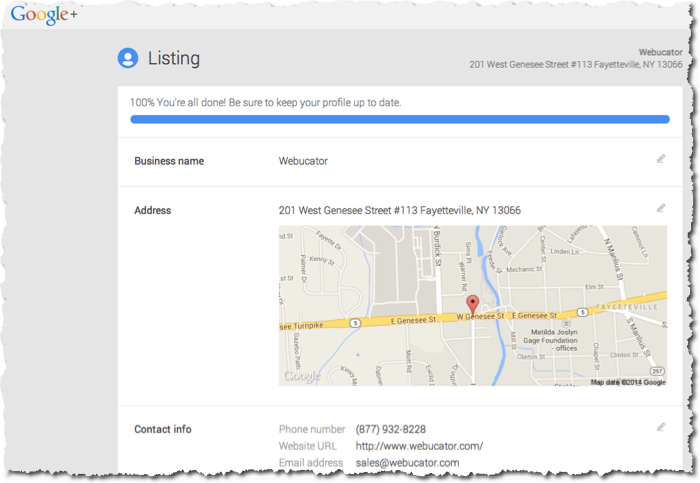 If you have a brick and mortar location, then listing your business on Google+ Local is a great way to increase your online presence in front of your local community. Make sure that you are using the appropriate Google Account to sign up for this service (recommended: same as AdWords account). Sign up for Google+ Local at http://plus.google.com. Once in your account, head over to Pages on the left column under your Dashboard, and choose the appropriate page type. Most often, you will be choosing the option of: Local Business or Place. Fill out your business information to claim your listing (refer to the screen shot). Validate your listing with Google+ Local with phone or postcard You will be contacted by Google with a short code. Go to your Google+ Local dashboard and activate your account. Actions: the number of times people interacted with the listing; for example, the number of times they clicked through to the business' Web site or requested driving directions to the business. Top search queries: which queries led customers to the business listing. For example, are they finding the listing for a bike store by searching for "mountain bikes" or "street bikes"? Zip codes where driving directions come from: which zip codes customers are coming from when they request directions to your location?